Here's a blog from Heather about how we work with farmers to make the most of their land for wildlife..
That’s it – I'm going to to learn Danish. On a sliding scale, how easy do you think that will be? I gave it some thought last night and noted the pros and cons. 1) some Danish words sound remarkably like our own; mor means mum. 2) the Danish language seems to have musicality; we say, ‘see you later’, Danes say ‘hi, hi’. Welcome to The Bell House Hotel! Hot on the heels of last week’s announcement about our second corporate member I am pleased to announce that The Bell House Hotel have also joined us! Martin Harper's blog - definitely worth a read! Good News! Minsmere has a new corporate sponsor. Riverside Beef are the newest corporate supporters of Minsmere! Run by Jon Reeves, Riverside Beef grazes cattle on riverside pastures and water meadows across East Anglia. 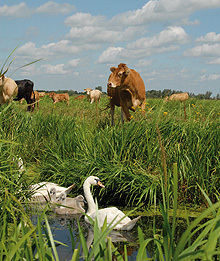 Riverside Beef have a strong tradition of supporting conservation – in large part due to Jon’s role as site manager of the RSPB’s Ouse Washes reserve! Stepping Up For Nature: February Steps. How many steps will you take? Submit Big Garden Birdwatch and Big (and Little) Schools Birdwatch results & put up a nestbox. Did you know February 14th is the start of National Nestbox Week? Check out your local reserve to see what's on in your area. Join the RSPB and make a small, regular donation to help us plan for future richer in wildlife. Hope is a small word, yet one which carries huge meaning: nothing less than our dreams and aspirations for the kind of life we want to lead and the kind of world we want to live in.